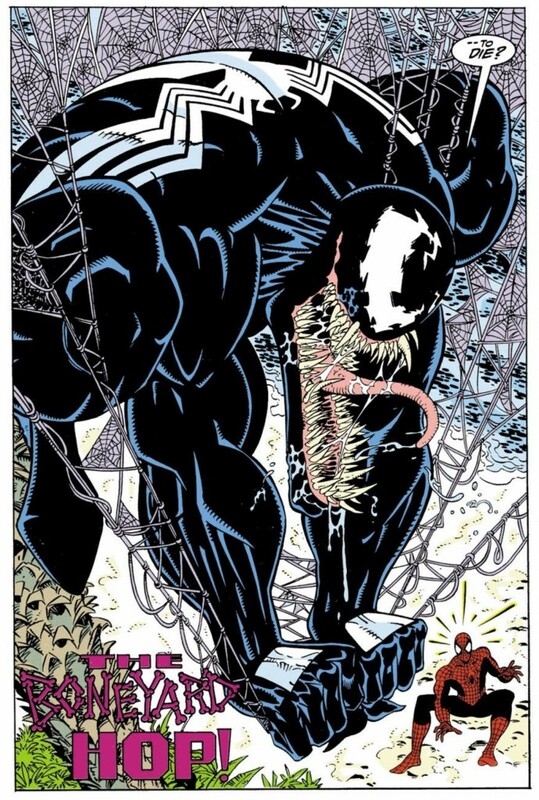 As Chasing Amazing concludes its first ever theme week, I’ve been asking myself why am I still drawn to Venom more than 20 years after seeing him in a comic book for the first time. You would think that my goodwill towards the character would have been destroyed years ago as Marvel milked Venom’s popularity for all of its worth, oversaturating Spider-Man and other comics with constant Venom appearances and then creating additional Venom/symbiote spawns like Carnage. And let’s not forget how Venom morphed from an emotionally complicated villain into a beastly-looking creature with sharp fangs and a lizard tongue who talked about eating brains. Point being, Marvel hasn’t done long-standing Venom fans very many favors over the years, but regardless of how the character was bastardized, I still love that kooky, deranged symbiote. And perhaps the answer to my rhetorical question as to “why” could be traced back to ASM #347. Sure, the cover image seems to celebrate the character degradation I was just talking about – fangs, slimy tongue and a poor attempt to quote Shakespeare. But at the same time, this issue and the preceding one, which feature Venom/Eddie Brock bringing Peter Parker/Spider-Man to a deserted island in order to kill him, have always been a guilty pleasure of mine: issues I know I probably shouldn’t openly profess my love for, but remind me of why I ever started reading comic books in the first place – because they’re fun. ASM #347 reminds me of my early collecting days in junior high school. Back then, about two or three people I knew who collected ASM comics all owned #347 and all of the other issues that featured Venom prominently. 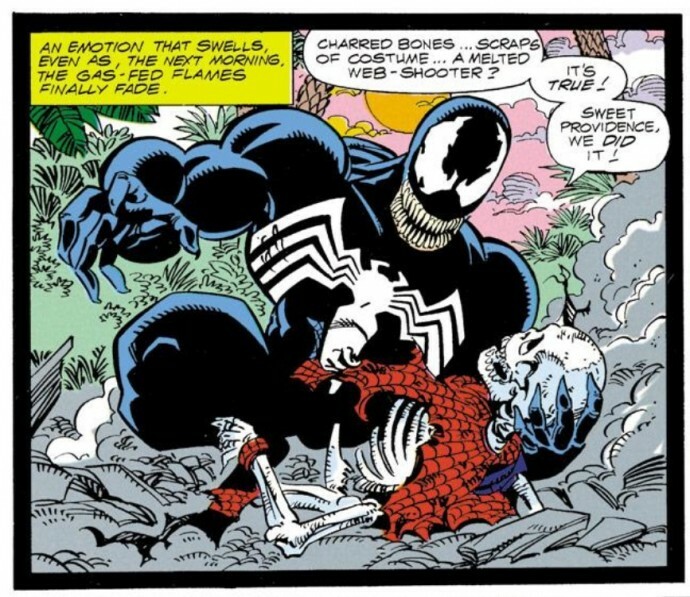 Because for a bunch of 13-year-olds, Venom was pretty cool –a bonafide badass villain who was also a bit of a renegade. In many ways, his popularity with my age bracket essentially forced Marvel into evolving the character into a pseudo anti-hero, who eventually moved on from fighting Spider-Man exclusively and instead focused on defeating the other symbiote spawn that started to sprout up around the Marvel universe. I used to roll my eyes at all of the Star Wars fans who were obsessed with Boba Fett – the guy was in Empire Strikes Back and Return of the Jedi for all of 10 minutes yet a legion of fans seemingly forced George Lucas into shoe-horning Fett into the prequels and into Star Wars novels. Many Spider-Man fans who came to comics in the early 1990s were the same way with Venom. We would buy up any comic book he appeared in en masse, necessitating Marvel to keep adding to the feeding frenzy. The first time I saw ASM #347 I was looking over a friend’s comic book collection and that goofy cover just seemed so over-the-top to me I had to own that comic. Let me clarify here – I needed to own that comic not because I was on a quest to own every issue of Amazing Spider-Man. 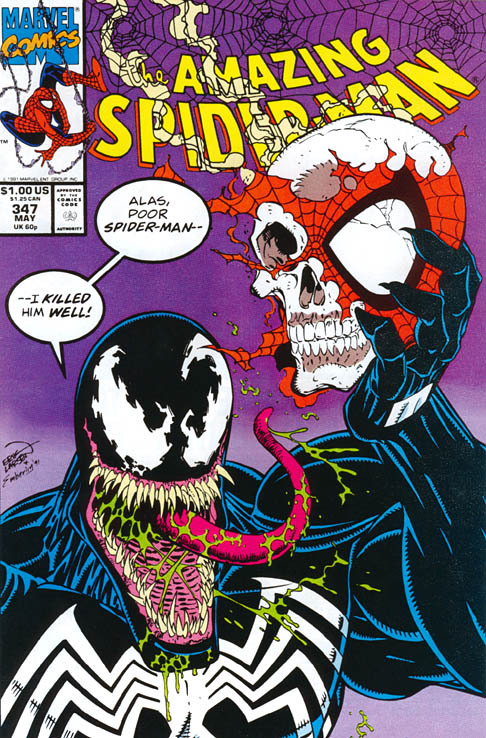 I had to own that comic because there was just something about Venom holding a skull of Spider-Man on the front page that tickled my fantasy bone in a serious way. Soon after that first encounter, I stopped by the local comic book shop with some saved up allowances and sifted through the back issues box and thought I had made out like a bandit when I picked up ASM 347 and a couple of other Venom issues for a couple of bucks a pop. I guess that’s more of a reflection of how much I overvalued those early Venom appearances, but regardless of how much the comic is worth now, I still treasure this comic. I treasure it because a treasured comic book doesn’t always have to be a hard-to-find, ultra-expensive first appearance book from the 1960s. Sometimes, the most treasured issues are those that are the most fun. Well, I would say the entire Hobgoblin storyline was one of the best in ASM history. I’ll probably do a “Reading Experience” post on it one of these days since Hobgoblin is going to play a role in this Spider Island arc. Meanwhile, thanks for the blog love. I aim to please and I’m glad you appreciate the approach I take. I used to have a great book with Venom on the cover, metallic, shiny. 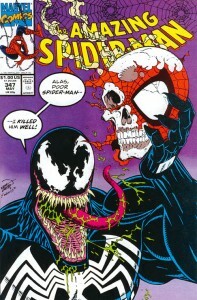 It had several issues of ASM with Eddie Brock, including the first appearance of Carnage, as well as the whole deserted island arc, and even an issue following that one of Eddie Brock deciding to go straight having “killed” Spider-Man. All these issues were in one book that my parents gave away when I was in the military, and I’ve never been able to find it again, can’t find its name, and am at a bit of a loss…do you have any idea what I’m talking about?